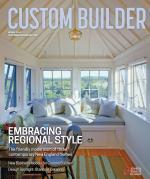 I’m often surprised at how long it takes small-volume builders to complete a custom home. It may be up to a year before construction even starts. Part of the reason is the time it takes to get through the design process, but it doesn’t have to be that way. Robert Hidey Architects has designed more than 50,000 residential units, including custom and production homes. We have established practices and processes that help reduce the time (and stress) that goes into residential design and construction—practices that are applicable to small-volume building. Construction time can be reduced to no more than eight months, which includes three months for approvals. During this process, the builder is vetting the design all along by getting bids. Therefore, we never end up in a situation where we find out at the end of eight months that the project is over budget and will take more time. An orderly process can eliminate time-consuming and costly duplication of efforts, backtracking, and re-dos, even though many developers accept them as a cost of doing business. A regimented schematic design process is essential, with several meetings involving the builder, architect, interior designer, landscape architect, purchasing agent, and, in the case of larger organizations, the marketing team. • Prior to the first meeting, we ask for a program that establishes a clear understanding of our client’s vision and expectations for design. • At the first meeting, we present ideas for interior spaces and the exterior character of the home to arrive at an aesthetic based on the client’s desires. • We come to the second meeting with refined floor plans and preliminary elevations representing the direction agreed upon at the end of the first meeting. • At the third meeting, we have a design that is marketable, with enough information for the client to receive preliminary bids to assess construction costs. This is a critical component in minimizing duplication and backtracking. All three meetings can be completed within the space of one month. Ideally, we stop work until the preliminary bids are evaluated to determine if we’ve designed a project that meets our client’s cost expectations. • Before transitioning into design development, we have a fourth meeting with trades and consultants to synchronize all structural requirements and other systems. This mitigates construction issues that could later arise. Next, the project is rebid to validate that we’re within our client’s construction budget. Subcontractors and custom builders need to be part of the process as early as possible. We insist that the people who will be executing our client’s vision always have a seat at the table. We frequently rely on them for feedback, as we move from schematic design to construction documentation. This collaboration saves time and money during construction. Budgets and timetables become an issue with change orders, so minimizing changes is a critical step toward a more successful project. Avoid change orders by using thorough construction documents in which everything is precisely illustrated—leaving no room for interpretation—and by holding preconstruction meetings with trades. We encourage client participation throughout the design process, so we can work though every issue long before construction begins. It’s important that the client has an opportunity to consider all of the options and is involved in the decision-making for every aspect of the design. In summary, conducting thorough meetings with full participation and creating unambiguous construction documents can dramatically accelerate the design and construction process and, in turn, make home building more profitable for everyone. Robert Hidey, AIA, is founder and president of Irvine, Calif.-based Robert Hidey Architects, which is active in community planning as well as single- and multifamily residential design. Comments on: "Guest Columnist: Boost the Efficiency of Your Building Process"